A young lady in her mid-twenties is reading a book on her lunch break, drinking nothing but Sierra Nevada pale ale. It must be nice to not have a job yet…but I do have one, and I need some sustenance, minus the alcohol. I settled for unsweetened, freshly-brewed ice tea. They make it great here. Vegetables are also a good bet, even when fried. The onion rings were huge, as promised by the cashier, and she made them sound tempting, which they were. The burger was portobello, loaded with raw white onions (I immediately took off), pickles (I ate on the side), lettuce, tomato and BBQ sauce (my request). The resulting burger was juicy and “meaty”. Today I’m working an extra hour, banking some time to use when I need to leave work early. 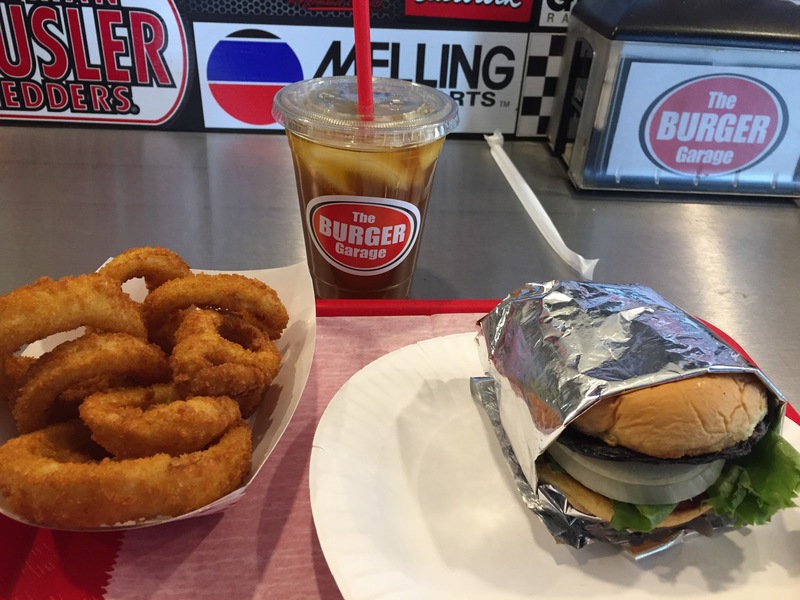 Luckily for me, The Burger Garage is a great place to satisfy hunger, and to “get your motor running” again.